Apple TV 4th Generation owns a high percentage share in the Internet TV Player Market. However, the biggest complaint heard is that the "hunt and peck"text entry using the Touchpad is difficult, time consuming and confusing. Also, the Siri remote is not steady to search something and it's hard to distinguish what you want from the voice. Customers simply want a QWERTY keyboard to work along with the simple and effective Apple TV 4 remote control. Once again, iPazzPort Mini Wireless Keyboards have solved the problem with the introduction of the KP-810-56S. Bluetooth enabled, the 56S pairs directly with your Apple TV set top box and gives you the simple ability to enter text for searches,passwords, router connections and more right from a traditional QWERTY keyboard layout. Even better, the 56S can hold the Apple TV 4 remote to be secured to the back of the Keyboard. 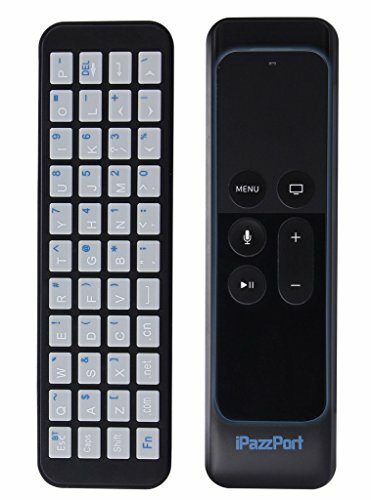 Use the Keyboard on top for text entry, flip it over for the convenient use of the traditional Apple TV 4 functions of your existing remote control. The best of both worlds, only available from the leaders in Mini Wireless Keyboards, iPazzPort. The 56S can also be used with other devices, this isn't just for the Apple TV. Pair with your PC, laptop, tablet,projector or other HID compliant device via internal Bluetooth. Kindly note, the Apple TV remote control is NOT included. One Year Replacement Warranty from iPazzPort, any problem ,contact seller directly, solution would be offered in 24 hours. If you have any questions about this product by iPazzPort, contact us by completing and submitting the form below. If you are looking for a specif part number, please include it with your message.